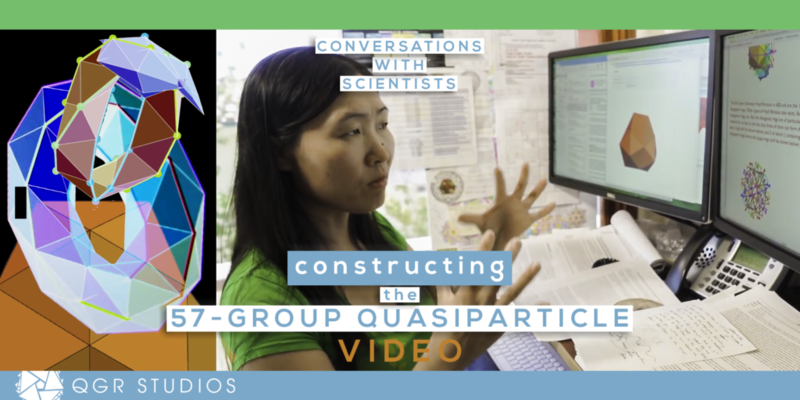 In Quantum Gravity Research’s video ‘Constructing the 57-Group Quasiparticle’, physicist Fang Fang discusses a geometric object called the 57-Group. Fang Fang, research scientist at Quantum Gravity Research, shows how the 57-Group–a structure that we propose as a quasiparticle–is constructed, and demonstrates how this quasiparticle can propagate along the “Hopf” loops in a 4D quasicrystal known as the Elser-Sloane quasicrystal, which is derived via a cut-and-project method of projection from the E8 lattice. The 57 group is an important geometric object in the 600-Cell. The 600-Cell is a 4-dimensional shape made of 600 tetrahedra. When the Gosset polytope is projected from E8 to 4D at a certain angle, two 600-Cells are produced, the ratio of their sizes being the golden ratio. Our founder Klee Irwin discusses a bit about the 57-Group in his blog: ‘What Happens to the QSN In The Case Of Extreme Spacetime Curvature, In Which A Black Hole Forms?’ .